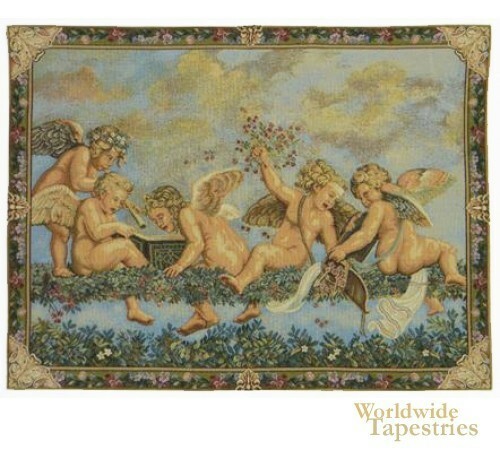 This tapestry "Les Angelots" shows a group of infant angels or cherubs. Here we see these angels on floral structures in the sky playing music and looking down onto the earth below. Cherubs were a popular figure from the Renaissance master painters who included them in their frescos of churches and chapels, to bring a more innocent and child like form to the angels. This religious or angel tapestry "Les Angelots" is lined and has a tunnel for easy hanging.